I have been working on seeing the United States fly a mission to Pluto since early in 1988. After a few weeks of discussions with colleagues and a little scheming and ritual screwing up of a 31-year-old's courage, my first meeting with NASA officials on this was held on May 8, 1988, in the office of Geoff Briggs. Dr. Briggs was NASA's Director of Planetary Exploration at that time. In that meeting I asked Geoff, "With Voyager about to arrive at Neptune, why isn't NASA even planning a mission to Pluto?" His deceptively simple response lulled me into a false sense of security: "Alan, we should be. I'll see about a study of how we might do that. We'll get back to you." 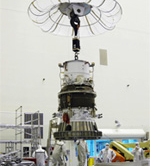 servicing facility on Dec. 1, 2005. 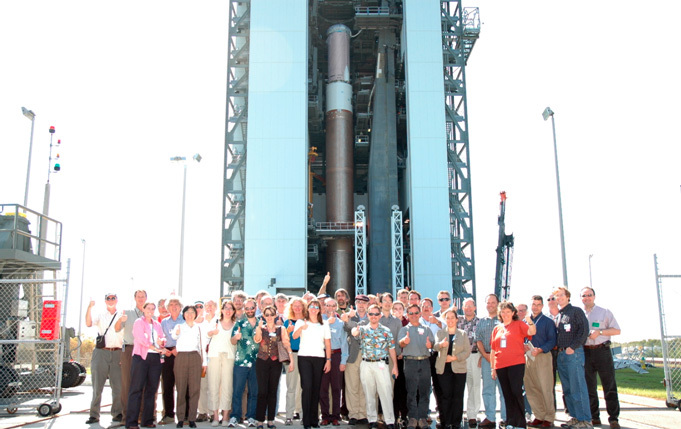 The New Horizons science team at Launch Complex 41 on Nov. 3, 2005. If I and my "Pluto underground" colleagues had known then what it would take, how many meetings, proposals, presentations, reversals, setbacks, and outright cancellations it would take to get that study turned into flight hardware at the launch pad, we probably would not have had the courage to take on the task. But who could have known? It sounded so easy after Geoff's positive reaction to a simple question. And so we began. Of course, it wasn't easy. But here we are, about 6,060 days, or 211 months later, and it's finally possible to say: "Next month, we set sail for Pluto." For the first time, we powered the spacecraft with our flight radioisotope thermoelectric generator (RTG), and everything worked — perfectly. 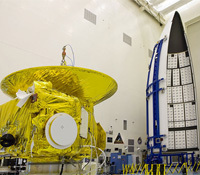 Our third stage was completed and delivered for mating to New Horizons. Our Atlas launch vehicle completed erection at Launch Complex 41 and went undertook its "wet" (that is, fueled) dress rehearsal of the launch count. 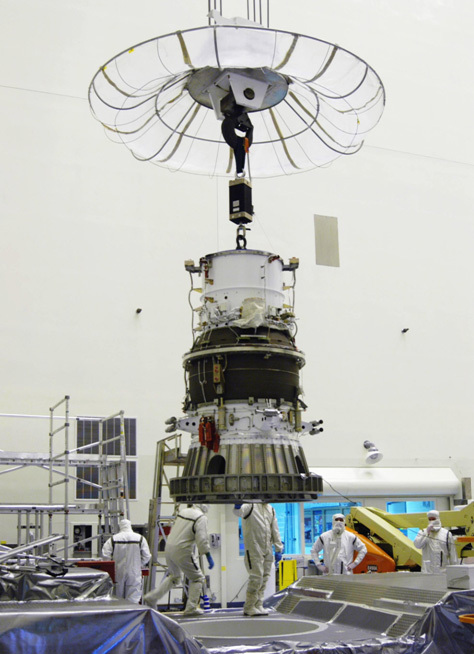 We conducted our final mission simulations and final spacecraft testing. We conducted our final spin balance testing. From the results obtained, we predicted the mass of the trim weights needed for balancing the spacecraft for flight, and then from that, derived a final hydrazine fuel mass load allowance of 77 kilograms. We fueled then the spacecraft with hydrazine propellant for flight and checked the fueled balance of the spacecraft with final trim weights installed. 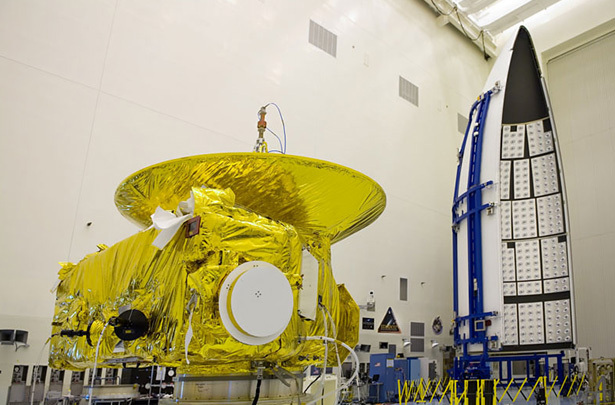 Regarding fuel, we were able to load 77 kilograms of hydrazine on New Horizons. The theoretical maximum — that is, a full fuel load — is 80 kilograms. But that's a lot more than we require to fly the mission. Calculations show we probably only need about 60 kilograms, and we have long said that our warm-and-comfy zone began at anything over 68 kilograms — some 85% of the maximum possible load. Well, 77 kilograms is 96% of the max possible load, so we are all very happy indeed. What made this possible? Simply put, the spacecraft came in a little light in its final mass, after spin balance weights had been added. 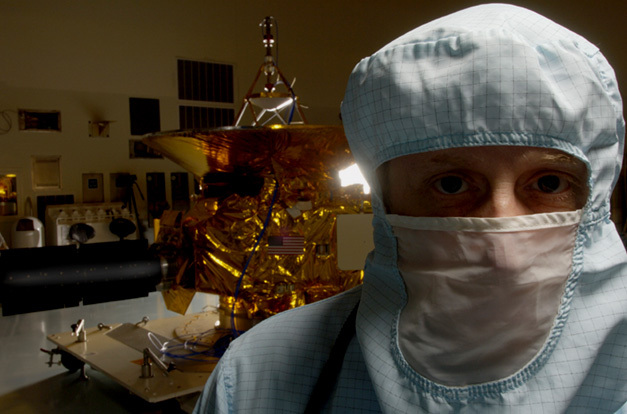 This is a credit to our spacecraft and payload engineering team in general, and most notably to Steve Vernon, the mechanical engineering lead engineer for New Horizons from the Johns Hopkins Applied Physics Laboratory. We are now on the heels of launch. And like any flight mission, we're dealing with a few final demons. For New Horizons, these include some increased testing of our "autonomy" subsystem — a software package designed to handle fault detection and correction when we're far from Earth, some delays in closing out the thousands of checks, reports and verifications necessary to prove we're ready to be certified for flight, and some concerns about rare but real commands that are "dropped" (or unprocessed) by the spacecraft's Power Distribution Unit (PDU). All that in mind, we're still on track for the opening of the Jupiter-Pluto launch window, which opens at 2:11 p.m. Eastern time, on Jan. 11, 2006. Ahead of us lies another launch countdown practice drill, some remaining testing of the autonomy system under more wide-ranging conditions that the original test plan allowed for, a lot of paperwork to close out, and a series of NASA pre-flight spacecraft and mission assurance reviews to ensure they are ready to authorize us to count down and launch. the distance, Nov. 4, 2005.
p.s. I plan to increase the rate of my postings to this Web site to once every week or so. I also plan to continue that pace through launch, and during the first few, critical weeks of flight as well. So get used to more frequent postings. You might also think about getting used to something else: A spacecraft en route to Pluto and the Kuiper Belt. the frontier of the solar system.